This UNEAC Commission for the Fight against Racism and Discrimination was created following an agreement in the VII UNEAC Congress in 2008 whereby Color Cubano would cease to exist and its work in the area of race in Cuba subsumed in the work of this commission. The Commission surfaced publicly in the fall of 2009. This commission was first headed by Heriberto Feraudy Espino, a former diplomat and researcher, and integrated into UNEAC's working structure. The decision to create it was taken by UNEAC's leadership after a study undertaken by a working group lead by Nicolás Hernández Guillén, grandson of famed poet Nicolás Guillén and president of the Fundación Nicolás Guillen. This is described in Sobre Color Cubano, 10/3/09, by Gisela Arandia. Heriberto Feraudy Espino, born in 1940, has had a long and distinguished career and served as ambassador to Zambia, Botswana, Nigeria, and Mozambique. He has researched and written on the role of African culture in Cuba and on AfroCuban history. The first act of this commission was a ceremony commemorating Mariana Grajales, mother of famed War of Liberation General Antonio Maceo. See Mariana de todos los cubanos 11/28/2009 Granma. Was renamed as the Comisión Aponte. On Monday, December 7, at 4:00 pm, Cuban intellectuals and artists will honor the memory of Antonio Maceo, with an evening in which Raul Roa Kouri will speak on the perceptions his father, 'Chancellor of Dignity' Raul Roa, had of the ‘Bronze Titan’. There will also be a launching of The anthology Race and Racism (Ed. Caminos), a compilation of essays and articles by Esther Perez and Marcel Lueiro, which will be presented by National Social Sciences Awardee, Fernando Martínez Heredia, and a special performance by Rogelio Martinez Fure, poet and Africanist. 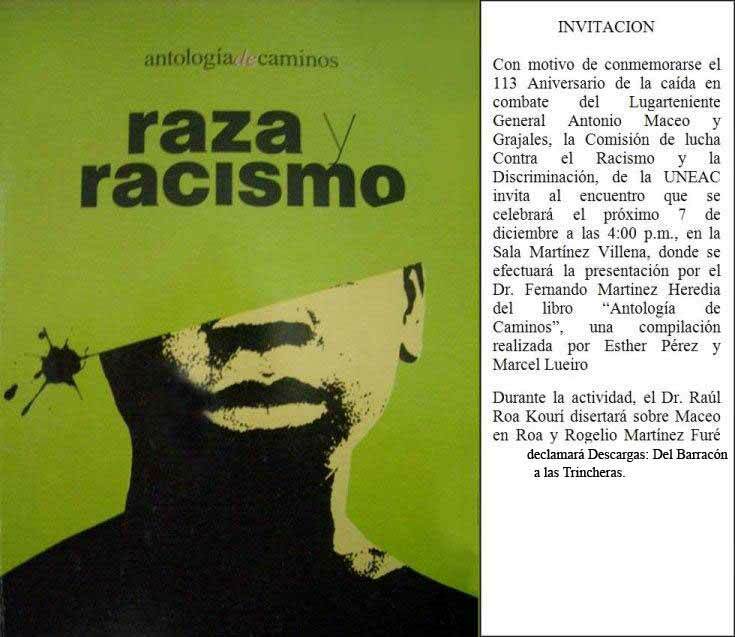 The event is convened by the National Union of Writers and Artists of Cuba (UNEAC) Commission for Combating Racism and Racial Prejudice, which was recently set up in accordance with one of the agreements adopted at the 7th UNEAC Congress. The first act of this commission was a ceremony commemorating Mariana Grajales, mother of famed War of Liberation General Antonio Maceo. Mariana de todos los cubanos 11/28/2009 Granma: "En cumplimiento de un acuerdo del VII Congreso de la UNEAC, comenzó sus trabajos una nueva comisión que aborda la lucha contra el racismo y los prejuicios raciales desde una perspectiva cultural. Como acción primera, una representación de la vanguardia artística y literaria acudió ayer viernes a rendir homenaje a Mariana Grajales, cuyo inclaudicable compromiso con la emancipación nacional y ejemplar entrega familiar, avalan a la heroína como madre de todos los cubanos." 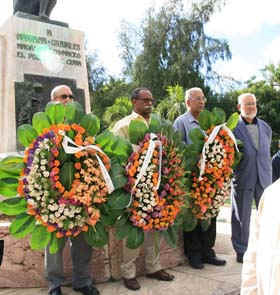 <== Heriberto Feraudy, second from left, in front of statue to Mariana Grajales.